Norway, a major oil exporter, offers generous incentives that make electric cars cheaper to buy, and provides additional benefits once the vehicles are on the road. The impact is clear. 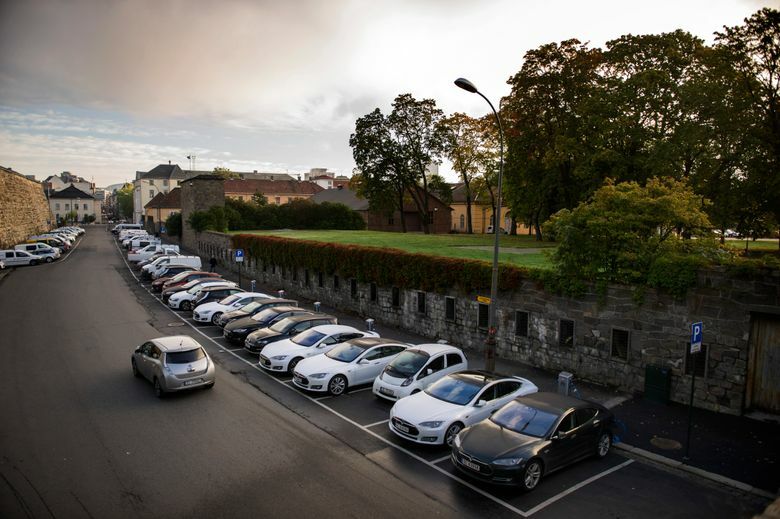 Sales of electric and hybrid cars in Norway outpaced those running on fossil fuels last year, cementing the country’s position as a global leader in the push to restrict vehicle emissions. Norway, a major oil exporter, would seem an unlikely champion of newer, cleaner-running vehicles. But the country offers generous incentives that make electric cars cheaper to buy, and provides additional benefits once the vehicles are on the road. Countries around the world have ramped up their promotion of hybrid and electric cars. As China tries to improve air quality and dominate new vehicle technology, the government there wants 1 in 5 cars sold to run on alternative fuels by 2025. France and Britain plan to end the sale of gasoline- and diesel-powered cars by 2040. Norway is ahead of the rest of the world. About 52 percent of the new cars sold in the country last year ran on new forms of fuel, according to data released by Norway’s Road Traffic Advisory Board, OFV. The share of diesel cars, which were once considered more environmentally friendly but are now in the spotlight for their noxious emissions, fell sharply. Sales of electric cars could have been even higher, according to Christina Bu, secretary-general of the Norwegian Electric Vehicle Association, but some buyers continued to hold out for newer models like Tesla’s Model 3. Although electric vehicles make up a just small portion of the global market now, automakers — including those, like Tesla, that produce only electric models, and giants like Volkswagen — have bet billions of dollars that such vehicles will soon be as cheap and ubiquitous as conventional cars. Investments in charging stations and other technology connected to electric vehicles are also increasing. General Motors and Ford Motor have said they will shift their focus to electric models, while carmakers like Volvo have moved to phase out the internal combustion engine entirely. Joining the fray are entrepreneurs like James Dyson who have their own plans to build electric vehicles. As the market grows, makers of electric cars are facing difficulties. Tesla has lagged in its production of the Model 3, its first mass-market offering. And a slump in overall car sales in the United States could put a crimp in the expansion of electric vehicles. Norway, which wants to phase out diesel and gasoline cars by 2025, offers a counterexample. The country’s embrace of electric cars has been hastened by hefty government subsidies and tax breaks that make the technology more affordable. The authorities have expanded the nationwide network of charging stations. They also offer electric-car drivers a bevy of other benefits: cheaper parking, the use of bus lanes for car-poolers during rush hours, and exemptions from the vast majority of road tolls. As a result, electric cars — identified by license plates that begin with the letters EL or EK — are a common sight. Teslas can frequently be seen on Norwegian roads, particularly in affluent parts of Oslo, the capital. Charging stations are relatively easy to find in major cities. “I had been wanting an electric car for a long time for environmental reasons, but they were expensive,” said Zanete Anderson Lilley, a senior adviser in Norway at the World Wildlife Fund, an environmental-advocacy organization. Lilley eventually bought a Kia Soul, a small five-door electric car, for about 200,000 kroner, or around $24,600, last summer. “If it wasn’t for the subsidies, I guess most people would still choose fuel,” she added. Despite the growth of electric cars, the vehicles, and the government’s support for them, are not universally popular. Last year, Norway’s conservative government proposed paring back the various forms of tax relief for electric cars. But the plans attracted criticism and have not made headway. For Adam Curylo, a bus driver who lives in Baerum, near Oslo, with his wife and son, electric cars have limitations. Curylo, a native of Poland, bought a Nissan Leaf electric car because it meant he could avoid paying road tolls. Although it functioned well in city driving, he was frustrated by the lack of charging points in more rural areas.